Mark O'Connor, Pearce Hanley and Conor McKenna are all in AFL action this weekend. KILKENNY’S DARRAGH JOYCE and Pearce Hanley of Mayo will face-off as the 2019 AFL Premiership season gets underway this weekend. Joyce has been named in St Kilda’s back line for Sunday’s home clash against Gold Coast Suns, who will have Hanley as a half-back. The pair are among five Irish players to be given starting berths, with Kerry’s Mark O’Connor to begin his season in the back line in Friday’s fixture for Geelong away to Collingwood. Zach Tuohy of Laois is still on the comeback from a knee injury that hampered his pre-season with Geelong. His absence ends an active record of 138 consecutive AFL games for the Portlaoise native. Elsewhere Meath man Conor Nash starts as a half-forward for Hawthorn, who visit Adelaide Crows on Saturday, while Tyrone’s Conor McKenna will play for Essendon against the Great Western Sydney Giants 24 hours later. Sydney Swans have included Tipperary’s Colin O’Riordan among their emergencies quartet for this weekend’s trip to Western Bulldogs. Dublin’s James Madden (Brisbane Lions), Cork’s Mark Keane and Derry’s Anton Tohill (both Collingwood), Kerry’s Stefan Okunbor (Geelong), Derry’s Callum Brown (GWS Giants) and Sligo’s Red Óg Murphy (North Melbourne) are all embarking on their maiden seasons as rookies with Australian Rules clubs, while Derry’s Conor Glass is also involved with Hawthorn. The opening game for the 2019 campaign saw Richmond Tigers defeat Carlton Blues 97-64 earlier this morning. 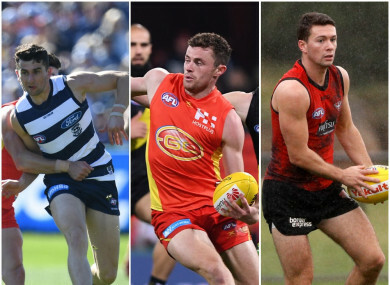 Email “5 Irish players earn starting berths for AFL openers this weekend”. Feedback on “5 Irish players earn starting berths for AFL openers this weekend”.